Did welfare reform help poor children? The child-poverty rate has declined slowly since 1993, and the rate of black child poverty is the lowest in history. 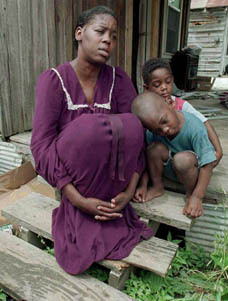 But 13.5 million American children still live in poverty -- the highest rate of any industrialized country. Conservatives attribute the decline to welfare reform, which forced millions of single welfare mothers to go to work. But child advocates like the Children's Defense Fund say that progress in reducing child poverty has slowed markedly and that cuts in social service programs made the poorest families poorer. Meanwhile, child advocates question why states are amassing huge surpluses in federal welfare funds and why food banks and homeless shelters are seeing more and more children of the working poor, even as Congress dawdles in raising the minimum wage.